The LMC has huts in the Lake District and in North Wales. We have a recently finished hut “Cae Ysgubor” in Beddgelert in the Snowdonia National Park, custom built for outdoor activities. 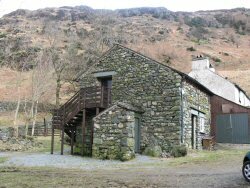 We also have a Lakeland hut, on land belonging to the National Trust near Blea Tarn, above the head of Langdale. Members may use both huts without prior booking. However, please check the website for availability before heading to the huts as they maybe rented out exclusively to groups occasionally. This pricing applies to members of LMC and also to Red Rope. LMC Members can sign in up to 3 guests. Hut payments for LMC members and their guests is by Direct Debit, four times per year. 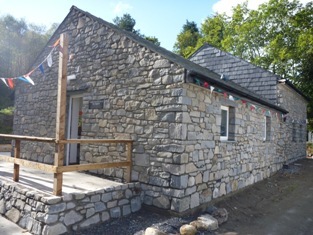 Anyone wishing to pay another way, by cash, cheque or BACs, MUST arrange this before visiting the hut, via the Treasurer, Hut Warden or the Chair of the Hut Management Committee. Red Rope members pay via the Red Rope Treasurer. All that members have to do is to simply pay a £20 hut key deposit on https://webcollect.org.uk/lmc/member-home – or alternatively contact the Membership Secretary at membership lancsmc.org. Both Cae Ysgubor and The Loft are available for rental at group rates, either for members or for external groups hiring the hut. Group rates are obtainable from the Hut Booking Secretary: email hut-booking@lancsmc.org. For Cae Ysgubor group rental, please contact our Hut Booking Secretary: Dave Sudell – Tel: 07812 390263, for prices and to arrange. It is vital that during the winter months water systems are drained down to avoid burst pipes. There are clear step-by-step instructions as to what to do at each hut when leaving.